ASPI has been located in Rockcastle County since it's inception in 1977. We are actively working to bring sustainable living practices to the communities that surround us. From the community gardens we have helped to cultivate, to the solar workshops and appropriate technology resources, our partnerships are an integral part of our operations. In order for communities to be self-reliant, our food systems must be local, and people must be able to access and afford to eat locally grown, safe, and nutritious food. Our Rockcastle River Wilderness Site organic garden was one of the first organic gardens in Kentucky. Our founder, Al Fritsch, advocated for Kentucky to implement organic certification. Through this legacy, we strive to help people grow their own food organically. We hold monthly food systems workshops, and provide tools and technical assistance. We work with college interns and run a summer market training program for 8 local high students. The students work in our community gardens and learn the basics of selling value-added products at the local farmer’s market. We operate two community gardens in Mt Vernon. We are exploring community garden locations in Livingston and at several assisted living facilities. Our rural community values meeting places like the Rockcastle County Farmer’s Market. We strive to grow the market and reach low-income populations. 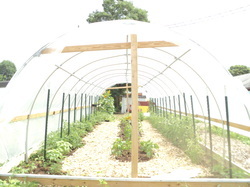 We also help local stores, restaurants and schools be able to offer locally grown food. Both of our sites have organic gardens. We use both sites as an outdoor classroom. We use a solar powered pump to access rainwater, and we operate a small solar greenhouse and high tunnel. We use both sites for the intern programs.